Which current driver is the most fun to watch? Watching the All-Star qualifying got me to thinking about which driver is the most fun to watch these days? Thinking about past drivers, obviously Earnhardt Sr was the first to come to mind. Loved him or hated him ...he was fun to watch. More recently, Tony Stewart was as well. You just never knew what Tony might do at any given moment. One of the reasons I was such a fan. Some drivers are very successful, but are very methodical and somewhat boring. Some may not be all that successful, but you like watching them. Either for daring on track moves, attitude, aggressiveness, lines they drive, temperament, off track antics, etc... So, who has that "fun factor" these days? The ones I've listed are just some that come to mind with me. If you choose "other" specify who and why. Larson first, Kyle Busch second. Larson has a Win It or Wreck It attitude, just don't feel CGR can give him everything he needs to get it done each weekend to win more, wreck less. Kyle Busch gets it done, always a threat. It can't all Toyota & JGR equipment otherwise Slamin and Swervez would be getting wins too, a few weekends of issues cost him wins. Last edited by Lastlap; May 19th, 2018, 10:41 AM. Hey MoparBob, who's your "other?" I wasn't biased, didn't pick Harvick. Definitely agree with this. I may be biased, but a lot of the moves I've watched Larson pull off over the years are moves I've only seen done by "balls to the wall" type of drivers like the Earnhardts, Stewarts and Busches of the world. I've seen him go from 14th to 7th from the start finish line to the backstretch in races where I thought he was done for sure. Watched him put on a clinic in his sprint car at Lincoln last year as well, when he was on his streak, going from 9th to the lead in 6 laps. While I'm not the biggest Kyle Busch fan in the world, it is entertaining as hell to watch him wheel a car and no matter what, you have to respect that. 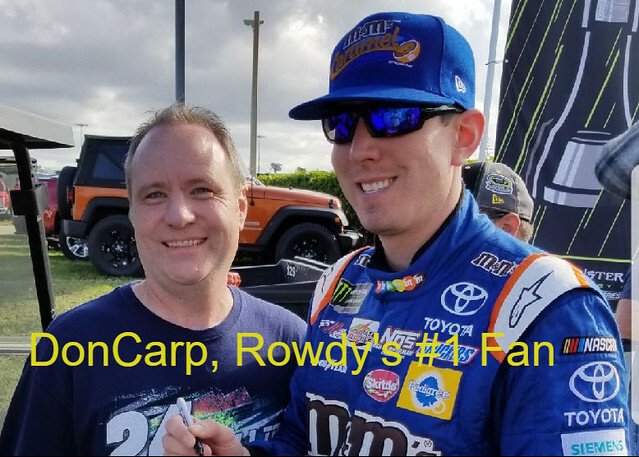 He's definitely head and shoulders ahead of the rest of the JGR boys, and would easily have more wins this season(and last season, too) if not for some of the issues he had. Kyle Larson, hands down for what he is willing to try. Busch more for what will he do next and/or say next. Larson for me, kid is a wheel man and he is not afraid to take risks. Would love for him to leave Chip, and see what he can do for HMS but it will probably never happen. I have 3 right now. Larson, Kyle Busch and Kevin Harvick are the guys I watch no matter how I feel about them. Harvick is like a shark constantly sizing the competition up, seeing if he can force an error on their part. Larson and Kyle Busch are a lot alike. Just a decade apart. Kyle Larson now reminds me of Kyle Busch then. Would take any line to get to the front and would wreck himself or anyone else if they thought that he could walk away from it with the trophy. Kyle L still over drives it where Kyle Busch doesn't any more. But Kyle B. just flat out wears the competition out when he is on his game, the cars can be too loose for anyone and he just whips em. And he does it across weekends in multiple series. Say what you will about Kyle Busch, but those 2 Bristol sweep weekends are some of the most impressive racing ever in my opinion. To win all 6 nights against a slew of drivers and talent, conditions, car/truck rule changes is no small feat. It might be one of the most impressive feats in racing history ever, especially for NASCAR. Stenhouse,hands down. I may not like the kid due to his bullcrap driving that Chase had to back out and save both. But to see him drive that equipment like he is. And he is driving with all he has. When he was nothing for years. I enjoy it. Chase Elliott I am biased about because he will drive aggressive but also tries to save his equipment. Bubby Wallace, he is fun to watch because his equipment is subpar. But he drives that car hard. And is tough to pass at times. Without Larson, the races would be boring IMO. Last edited by Nascar24; September 13th, 2018, 09:28 AM. I think Logano should get more votes. He's especially exciting on restarts.